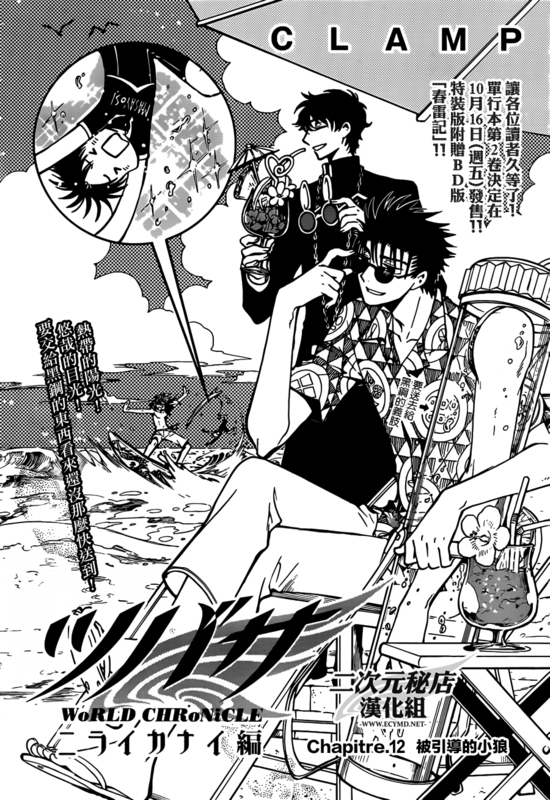 There is so much to talk about this title page… but most of all: why is Seishirou wearing his usual outfit at the beach?! And Fuuma simply will not leave Kurogane’s arm even for one minute — maybe he should haste and bring the arm instead of lazying around at the beach? xD There is a little note written beside the arm, I wonder what does it say… Super fun title page! The three looked pretty and healthy but once it sucked Syaoran and the lady in it became badly rotten? Hana is finally back! She met Sakura in a dream and somehow they united their powers and now they look very baddass. They seem to be acting together to help Syaoran and the others. 23 pages this month — shortest TWC chapter ever! 168 pages for volume 2 so far. The title page says that volume 2 will come out on October 16, which probably means that Chapter 12 is the last chapter of volume 2.